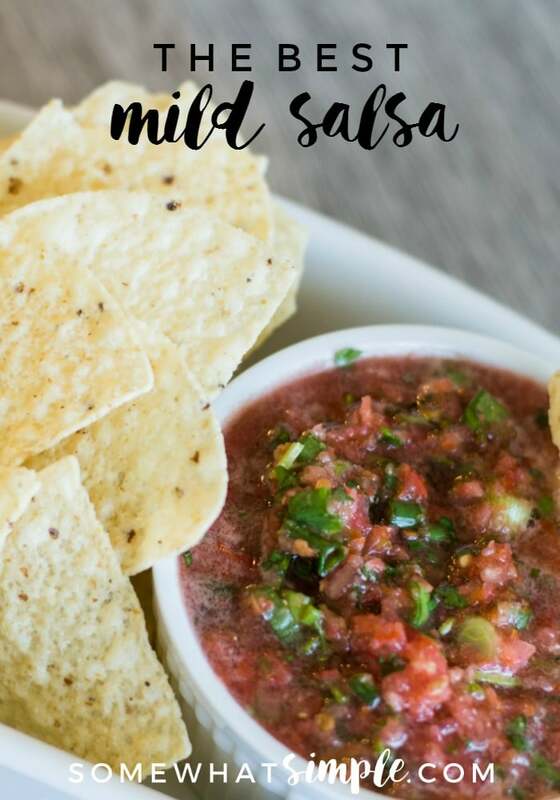 This mild homemade salsa recipe is so easy to make and tastes amazing! This restaurant style salsa is made with fresh tomatoes, green onions, cilantro, limes and pickled jalapenos. It’s the perfect blend of fresh vegetables and savory spices that is perfect for dipping. 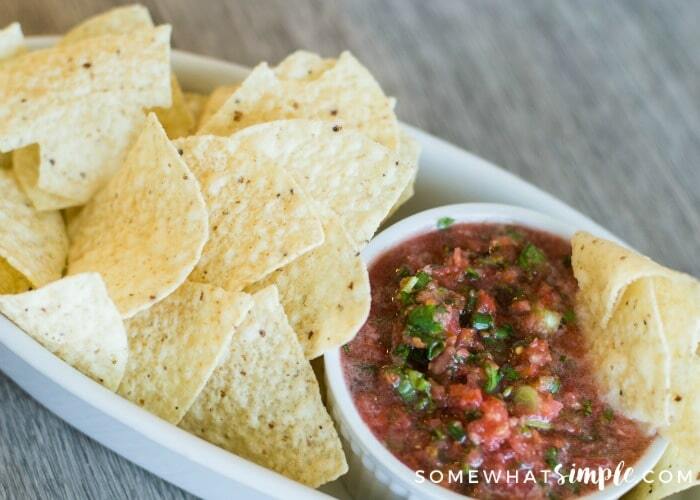 Salsa is one of my favorite dips to serve when I’m hosting a party. Some of the other dips that are a huge hit are these Buffalo Chicken Dip, Spinach Artichoke Dip and Chicken Enchilada Dip recipes. 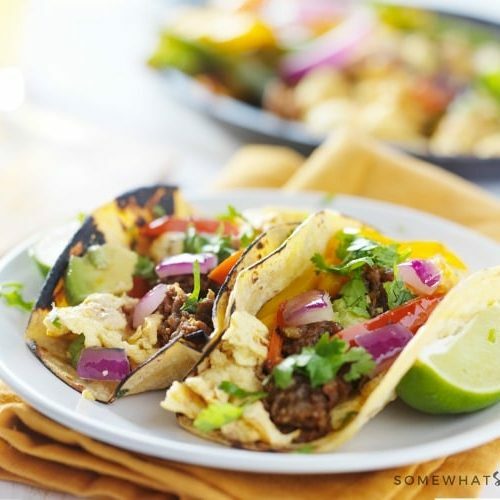 First, let me start off by saying I am a HUGE lover of homemade salsa – I can’t get enough of it! It has to be fresh and it has to be mild. Call me a wimp, but I like to taste all the flavors of my homemade salsa instead of wondering why my tongue is burning. If there’s too much of a spicy kick and all I taste is the pepper, then snot starts running down my nose – what fun is that?! However, if you prefer a spicier salsa, with just a minor modification, you can make this as hot as you like. I made this restaurant style homemade salsa for a girls night and half of the huge batch was gone in 60 seconds. The other half was finished the next day during Sunday dinner. I think people liked the salsa and chips more than my enchiladas!! (GASP!) My kids love this homemade salsa recipe so much they can’t wait to dig in! Addie actually skips the chips and digs in with a spoon! Like I said, I’m a real wimp when it comes to salsa but I know there are many out there who love more spice to their salsa. This recipe calls for using 4 medium jalapenos but sometimes I stop at 1 or 2 because they can pack quite a punch. If you want a hotter salsa, simply continuing adding more jalapenos to the recipe until you reach your desired heat. This homemade salsa recipe is loaded with delicious fresh vegetables and spices and no preservatives. 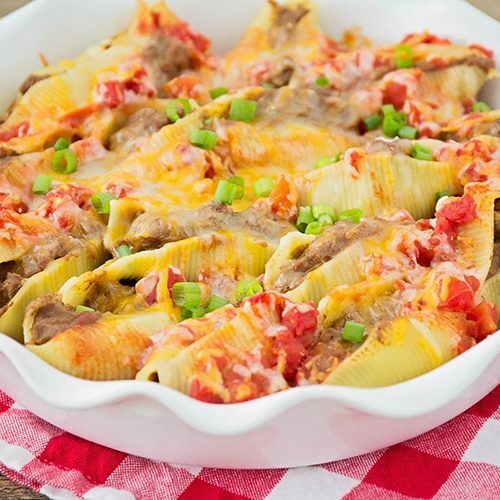 With only a few calories per serving, it’s a healthy addition to any recipe. This homemade salsa recipe goes great with some of my favorite recipes. Here are few suggestions that we think you will love! If you loved this homemade salsa recipe, here are a few others to try. Seriously you all need to make this salsa today. It will not disappoint! Now that you’ve seen just how easy this mild salsa recipe is to make, it’s time to make a batch of your own! Here is a quick video showing just how simple and easy it is to make. 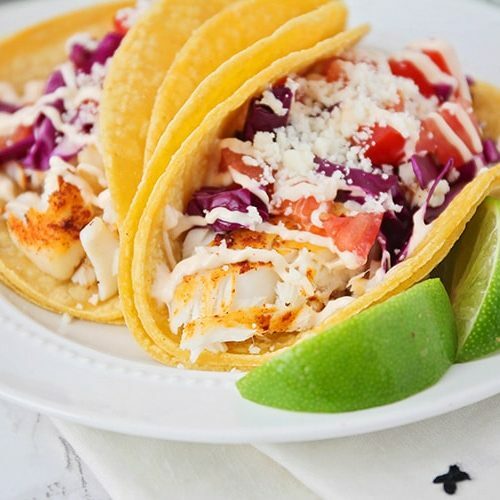 Leave us a comment below and let us know how much you loved this salsa or tag us on social media the next time you serve this recipe because we always love seeing you make one of our recipes. This homemade salsa recipe is so easy to make and tastes amazing! 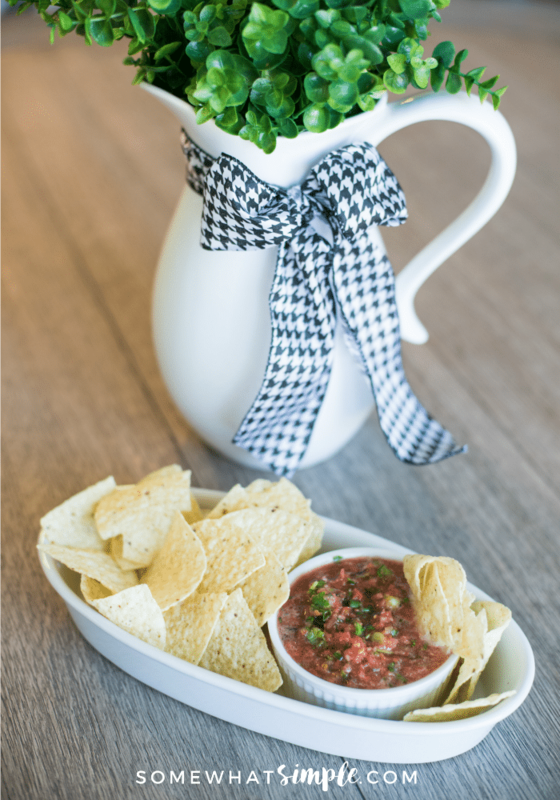 This restaurant style salsa is made with fresh tomatoes, green onions, cilantro, limes and pickled jalapenos. It's the perfect blend of fresh vegetables and savory spices that is perfect for dipping. Chop tomatoes very fine by hand or in a food processor being careful not to puree. Put tomatoes in a large bowl. Chop jalapenos very fine or you can add them to the tomatoes as you put them in the food processor. Add lime juice, salt, garlic, cumin, and sugar to the bowl and stir until well combined. * Pickled jalapenos come in a can on the Mexican Food Aisle. The original salsa recipe calls for 4 medium pickled jalapenos, but sometimes all I need is 1 or 2 because you never know how spicy they will be. So start with less and add more to your liking! Nothing like fresh salsa. It looks delicious! Your little one proves that point. 🙂 Thanks for sharing with SYC. It makes a big batch, but if you like salsa…..it goes fast! We are Mexaholics, so we’re always up for a new salsa recipe! I’ve never seen instructions to “shave” the cilantro leaves off the stalk — would love to know more about this! Sounds delish! I'm using your quesidilla recipe so I'll have to make this salsa too! I awarded you a blog award! Oh My Goodness! This sounds sooo Good! I love Salsa! I can't get enough of it! It's 7:30 in the morning, I saw the picture and before I read anything, my mouth started watering! I thought this was going to be your rotel salsa recipe, but this one sounds super good! I could eat salsa all day! My mouth was watering at the picture…mmmmmm looks SO good. I love salsa too!! And I also like it more on the wimpy side but not because I don't like hot foods, I just wanna taste all the yummy flavors in salsa! 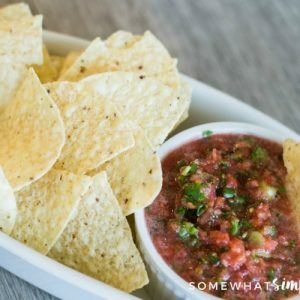 I am a sucker for homemade salsa! We don't buy salsa anymore. 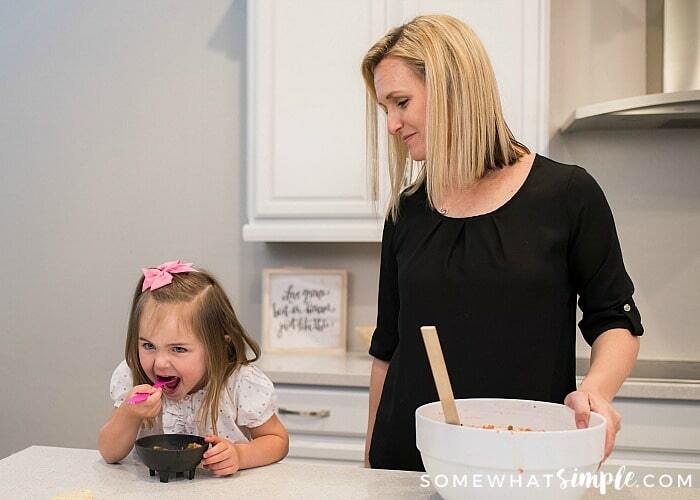 I usually make a fresh batch every 2-3 weeks as it is a staple at our house! YUMMY! I'm a big salsa lover too! How can I be hungry for it this early in the morning? Thanks for sharing the recipe.